Today, we are talking about cold storage. That is refrigeration and freezing. I know that for many people, refrigeration is a very serious topic, which mostly has to do with exciting features. Through the door options like filtered water on tap and your choice of whole or crushed ice cubes. The new fangled ones where you can open part of the fridge door to get access to things kids need like gallons of milk and large containers of Sunny Delight. 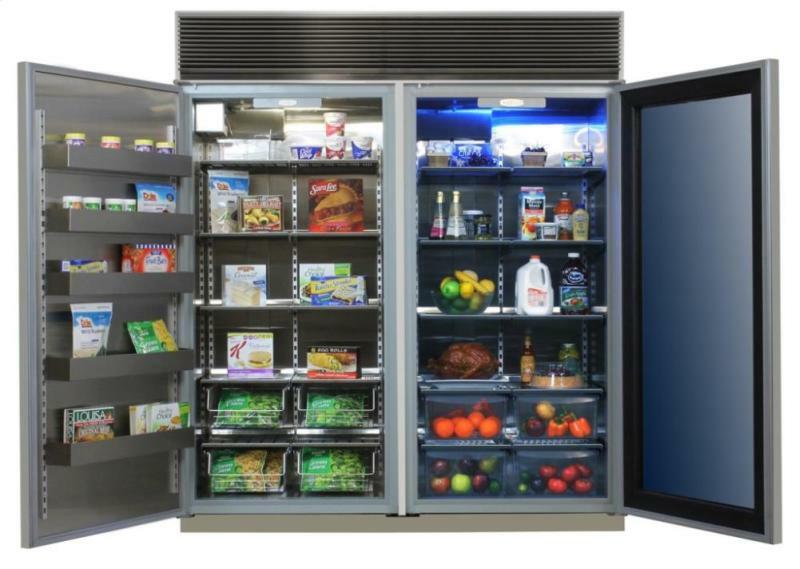 There are fridges that have smart technology that can do everything from keep track of expiration dates on the perishables to scanning barcodes so that as you use the last of something it can go right on your grocery list. There are people who swear by the freezer drawers on the bottom, and those who love a French door on top. Some people want the fridge to disappear into their cabinets, and some want a statement piece. Hipsters often covet the colorful and retro looking SMEG options, and those with sophisticated urbane tastes immediately sigh “Sub-Zero” with reverence. Once again, when it comes to kitchen design, there are actually no rules, and no wrong answers. It is YOUR kitchen. I am not here to tell you that our decisions are the “right” ones universally, just that they are the right ones for US. For me, sharing all of this is more about the process than the products. I want you to know how we chose these items and why, so that it can help inform your own process when it is time for you to tackle a project like this. Of course, I want to give you plenty of info on the products we did decide upon since we are very excited about these choices, and since some of them may not be familiar to all of you. But we aren’t promoting any of them exclusively, except for saying that they are all the absolute perfect choices for us and the way we live and cook and we believe strongly in their quality and recommend them wholeheartedly if the way you live and cook is similar to ours. That is to say, there is nothing in the world wrong with fancy features and stylish looks, and Sub Zero makes a perfectly great product. But that just isn’t the right fit for us. 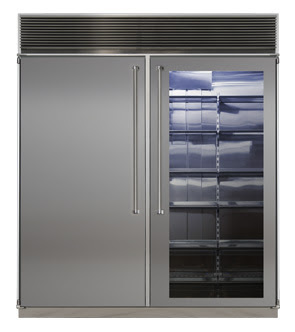 When it came to finding the right fridges and freezer, we started once again with our list of needs and wants. Which began immediately with looking at 72” options. Yes. That is not a typo. We wanted a full 36” column of fridge, and a matching one of freezer. Why so much space? Our fridge. After returning from 4 days away, BEFORE we hit the grocery store. The door. So. Many. Condiments. The freezer. Can't really see? That's because it is PACKED TO THE GILLS! Freezer door. When one cooks and bakes, your freezer needs lots of room for spices, nuts, etc. since those things can go rancid at room temp. We have a chest freezer in the basement as well as a commercial fridge for extra space because our actual fridge holds so little. And forget parties. There is no room for extra stuff. It is one thing when this means up and down the stairs from the first floor to the basement to grab necessities, but the new kitchen is on the SECOND floor, and we are middle-aged people with wonky knees. So we wanted to have a lot of space in both the fridge and the freezer. For us, in the main fridge, depth was going to be key. We are putting the fridge and freezer in their own little nook, not amongst the cabinets, so we didn’t need to restrict ourselves to cabinet depth models. We wanted a fridge that could accommodate large serving platters, as well as big pots full of yummy stuff. Since I am a fan of using clear plastic organizers in the fridge, we didn’t need there to be a lot of interior bins and such, just easy to adjust super sturdy shelving. And since we were looking at such a large unit, we wanted the option for a glass door on the fridge. We don’t have kids, so we don’t need the fridge to function for art display or family calendar or chores wheel…and such a wide expanse of stainless would be a little monolithic. By looking at glass door options, we could break up the monotony a bit. I also like the idea of being able to see what is inside a bit without standing in an open fridge letting the cold out. Effectively, we wanted commercial styling on the fridge side. 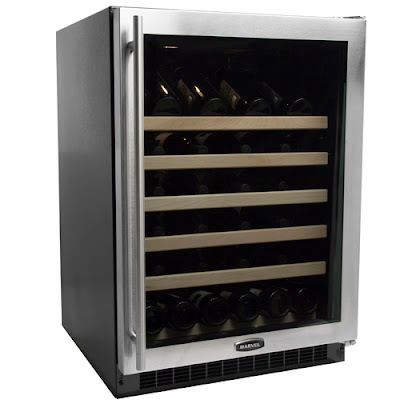 We were also looking at two undercounter units, a 24” wine fridge and a 15” wine fridge. The 24” unit would be for wine, allowing us to keep a stock of our everyday tipples right in the kitchen for ease. Charming Suitor was excited to be able to pull out a couple dozen bottles that are perfect for drinking right now and have them at our fingertips. The 15” fridge is for the kitchen library. For cheese. I know, I know, but there is actually method to our madness… Cheese is best stored at temps that are slightly higher than what your regular fridge is set at. They also prefer a slightly more humid environment, which is not good in your regular fridge. We love cheese. We love it a LOT. And when we entertain, we pretty much always do a cheese course during dinner. There are always no fewer than four different kinds of good cheeses in this house. So the idea of creating a really perfect environment for them to keep them at their best was very exciting for us. A totally cheese geek thing to do, but this is a dream kitchen after all, and we both dream in cheese! The smaller wine fridges are easy to set up for cheese storage, you just set the temp for 55-58 degrees (about 15-20 degrees higher than your regular fridge) and add a small battery operated humidifier, and with some shelf reconfiguring, you have a perfect little cave for your favorite cheeses, from the oldest parm to the freshest chevre. Here is where we depart from many, in that we don’t want a freezer that does anything except maintain freezing temps with plenty of storage. We don’t want it to make ice or filter water. We are addicted to Chicago Classic Cubes, clear ice cubes that are one and a half inches square and are great for cocktails and soft drinks alike…they melt slow and don’t impart any off flavors or little particles of floating stuff. Now, we are also just two people who drink mostly water out of carafes we keep in the fridge, and almost no pop, so we really only use cubes for cocktails, and guests. But the trade-off for us of both not losing any freezer space to ice making equipment, and also not having to have a water line installed, or filters to manage, we just wanted a freezer big enough to load in a couple bags of our beloved square cubes and we would be good to go! Again, if you are a family of four or five people who love their fizzy drinks cold, you probably do want an ice maker, it just wasn’t something we had on our list. When we set out to do the research, we looked at all the usual suspects, and many of them had fine options. But remember when we did the beverage center in the Media Room? 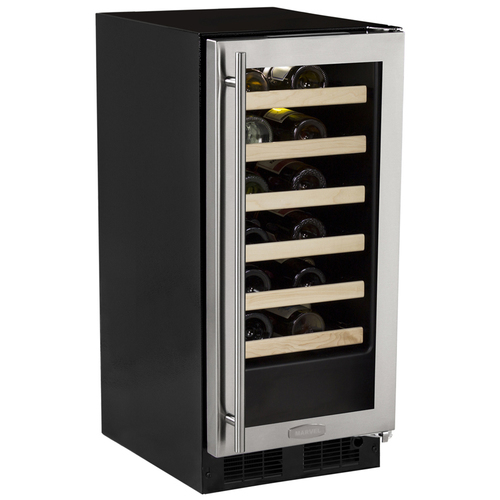 We knew after several months of great use that Marvel makes a truly great product, so we were already committed to buying their wine fridges for the wine and cheese. And then we looked into their larger scale models. It came as no surprise that as the oldest refrigeration company in North America, they were the first to pioneer the large scale fridge freezer for home use! The biggest interior capacity available, with some great features like stainless interior, perforated metal shelving in the freezer for airflow. Clear bins at the bottom, easily adjustable shelves, metal bins on the freezer door that are also easily adjustable. They had the glass door feature available, and the freezer could come with or without an icemaker. Plus, the machinery is all on the top, instead of built into the sides of the unit, so the interior capacity is astounding...over 20" deep, 31" wide, and 65" tall on each side. I could literally cry, that is how excited I am to get this thing up and stocked! We knew that we have been so impressed with the unit we already owned; we had complete confidence in the larger models. So it made life easy, we could be an exclusive Marvel home for all refrigeration and freezing needs! So, once again, your takeaways are much the same as with any appliance. Make a list of how you intend to use the appliance, what features are most important to you and your family, and what your budget is, and then jump into research with both feet! 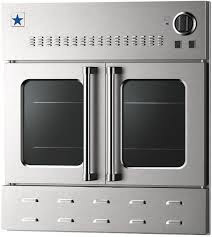 In other news, so far no one has guessed the correct color of our wall ovens, so it is not too late to enter to win! You can post your guess in the comment section on the BlueStar post…contest stays open till someone guesses correctly or the ovens arrive shortly, whichever comes first! Today, we are talking about the workhorses of the kitchen. That would be the rangetop, ovens and hood. These were the first appliance decisions we had to make, because in order of importance for us, they were key. We needed to know about these four pieces first since every other appliance in the kitchen would be affected by the choice, budgetarily. Remember how I said you have to prioritize everything you want? When it is time to do your research, start at your top priority and make those decisions first, otherwise you might fall in love with something fun at the bottom of your list and end up either devastated when it doesn’t end up fitting into the budget, or you might end up compromising quality on some key items to force it to fit. Neither of these is fun. So, we began at the beginning. First there is fire. For cooking. We knew that we couldn’t actually install commercial units (not that I didn’t look into it), but we also knew we wanted to get as close as we could to that kind of functionality. I looked into most of the brands that everyone knows already (Wolf, Sub-Zero etc. ), but got wildly different reports on how well they worked long term. And I had already had experience with a Viking and knew that it wasn’t a good fit for us. A chef friend suggested we explore BlueStar. To be honest, I hadn’t ever heard of it, which concerned me, since I think of myself a somewhat on top of these things, but the recommendation was a strong one, so I started to explore. And talk about a light bulb moment! The company used to be Garland, who made the single best professional stoves available for restaurant use for YEARS. When they converted to making products for the home cook, they upped their design a bit, but kept every inch of the amazing functionality of their commercial products intact. When I had toyed with the idea of really installing restaurant equipment, I had been looking for a Garland, so it seemed a bit like destiny. And since they make rangetops, powerful hoods, and wall ovens, we were hopeful we might knock off all of our priority choices in one place! Charming Suitor and I headed to a showroom that carried the brand, because at the end of the day it doesn’t matter how cool something looks online, or if the features sound good on the website, you have to really meet it in person. Arranged marriages are not a good idea in the appliance world! Go on a date. Several. Really get to know each other. Look for warts and closet skeletons. At the showroom, we started with the rangetop, and we were hugely impressed by the simple style, and clearly amazing function. They are supremely well-built, with a-ha features galore. 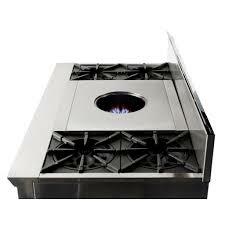 For example, even though they have a low-BTU simmer burner, all of the burner grates have a heat tamer feature built-in. If you pick up the center part of the grate, turn it a quarter turn, and put it back, it elevates your pot an additional inch or so above the flame. Meaning your regular burner can become a simmer burner, and your simmer burner can get so delicate you can melt chocolate without a double boiler and not scorch it! AWESOME. Also, these center sections of the grates all come out, so any burner immediately can become a wok burner without special extra equipment. All the pieces come out for easy cleaning, and there is a thin tray underneath the burners that also slides out, so all those bits and pieces you drop, or the occasional (or in my case, weekly) boil-over is easily remedied. Each piece is made custom, and you have options in terms of a range of BTU burners (they offer the highest for home cooking—up to 25,000! ), they have grills and griddles, French Tops (my fave! ), you can configure your range the way you want it. It was pretty much love at first sight with this thing, and when we saw their hoods were designed to work perfectly with their ranges and had serious blower power, we were really sold. But if the rangetop and hood were like the perfect meet-cute and heavenly first date? The wall ovens were where we fell head over heels in love. The gas oven was first, and it is superlative. Not only did they have bigger capacity than the same sizes of other brands, meaning that we could do the smaller 30” ovens instead of 36” without losing interior capacity, (so I can fit a full size commercial baking sheet in the 30” oven). But they had every feature we had on our list. French doors? Check. And not only French doors, but French doors that BOTH open when you pull either one of the handles, so that you have one-handed usability when the other has a tray of cookies in it. Full-extension shelves? You betcha, and on super smooth rollers. Plus the stuff we hadn’t considered, like the broiler (1850 degrees of infrared heat for serious browning) and true convection, not just a fan. 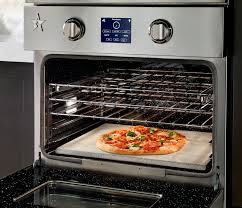 The gas oven has a 25,000 BTU burner, plus an additional 3000 BTUs for heat assist when preheating, so it warms up quickly. 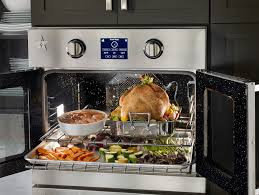 The electric one has many of the same features, with a 2500 watt baking element, and an additional 1800 watt heat assist for preheating, and a 5000 watt broiler. The electric one also has its own bonuses…like a built in baking stone with temp control, a temperature probe, 12 different modes including everything from Proofing to Convection Roasting. (It even has a Sabbath mode for my Kosher friends! Who knew???) Plus my new favorite feature? An eco-friendly continuous clean feature that automatically keeps it sparkly. CS and I were giddy in the showroom. And by giddy do I mean that we did an actual full-out happy dance when the rep left us alone to take a call? You had better believe it. I really hope, in retrospect, that there is not closed circuit camera footage of that. We knew we had found our “anchor” appliances, and could not have been more delighted. Until they asked about color. Want to take a couple of cooking geeks and really send them over the rainbow? 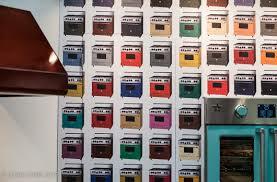 Tell them that their dream appliances can be made for them in over 256 different colors. Yes, we do dream in color! We looked at each other, twin grins exploding our faces. Oh. YEAH. I love these things so much I actually wrote them into Recipe for Disaster! 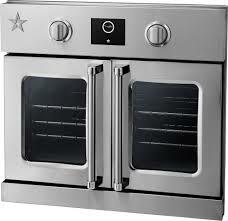 So, yes, it is official, we are going to be a proud BlueStar home for rangetop, ventilation, and wall ovens. We are doing the 48" rangetop with four burners and a 24" French top, a 54" hood (you always want your hood to be slightly wider than your range) a 30" gas wall oven and a 30" electric. 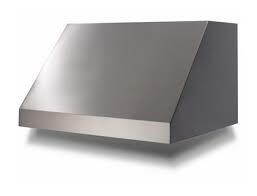 And while we are keeping the rangetop and hood both a classic stainless steel…the wall ovens are going to be in color. And the first person to guess the color correctly in the comments section will receive both a copy of Recipe for Disaster (starring BlueStar!) and a copy of my digital cookbook Big Delicious Life! Stay tuned, next time we talk about fridges, and there are some fun surprises there as well!